We have returned to our sweet hometown along the Gulf Coast. There is still a bit to do before moving back into our house but we are enjoying being here. It is nice to feel the heat of the sun and see the moonlight sparkling on the bay waters. I am also really enjoying driving my dear sweet mini van again. Rob and I both find ourselves driving slowly with the windows down in the cool of the evening listening to the cicadas and tree frogs. Their songs always remind me of summer camp and porch swings on long summer nights. Air conditioning in our cars and houses is wonderful to escape the smothering 95 degree heat of the day, but sadly it also blocks the sounds of life going on outside. That is one of the things that we enjoyed about walking everywhere. Life slows down a great deal when you live where you can walk most places you need to go. Meg jumped up on her first morning back and had us take her to the community pool where she promptly signed up for the last few weeks of swim team. She is a very determined girl when she sets her mind to something. Two months before we left Durham she was already thinking about swim team and she and Joshua began training three days a week in the Freeman’s Quay pool. Such a planner, our Meg. She has already competed in her first swim meet of the year. We all had a grand time cheering her on. My sister and little nephew even came down to cheer. My nephew isn’t quite two and every swimmer that he saw in a yellow swim cap he thought was Meg. “Yea! There goes Meg” It was so much fun to watch him try to figure it all out. 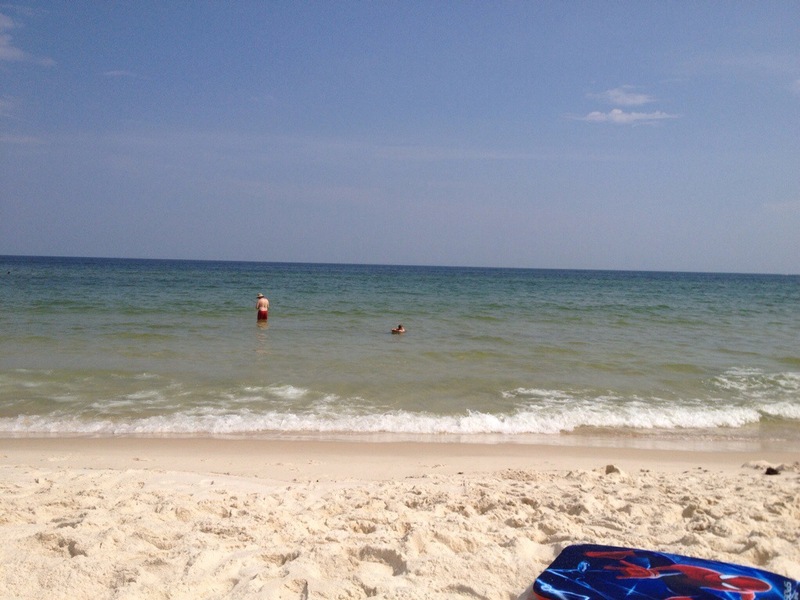 Yesterday the four Haynes family members decided it was time to head to the gulf and put our toes in the sand. 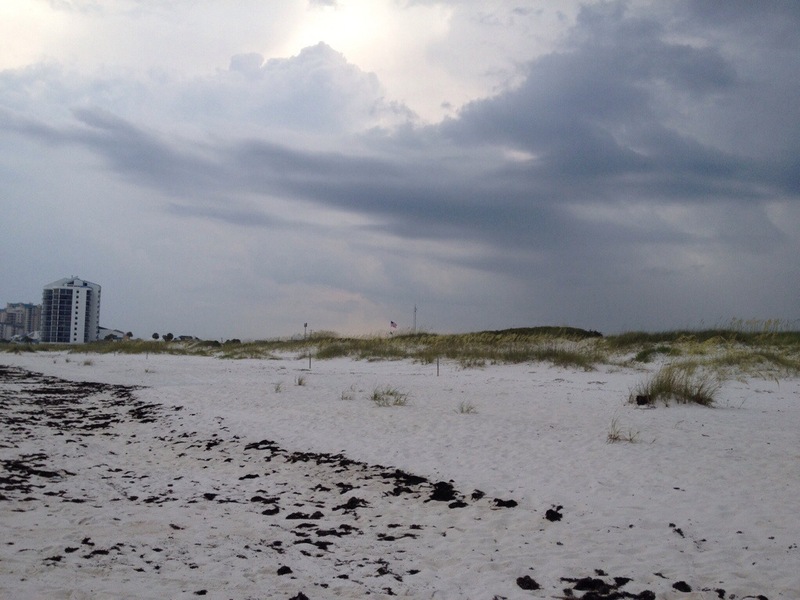 We headed over to our favorite spot, the Gulf Islands National Seashore. These island beaches are all part of the US National Park System. 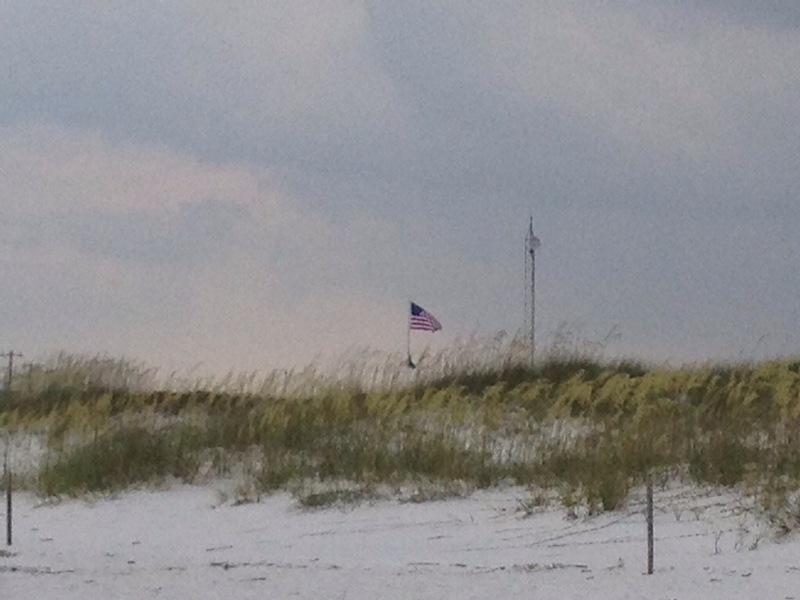 An annual pass is $25 and includes the beaches and Fort Pickens. The facilities at our favorite beach are really nice. They have covered picnic pavillions, barbecue areas showers, bathrooms, life guard stations, and close parking. You can even overnight tent camp on the beach. The sugar sand and cool emerald waters were so good to see again. Rob did some surf fishing and we all had a relaxing afternoon. 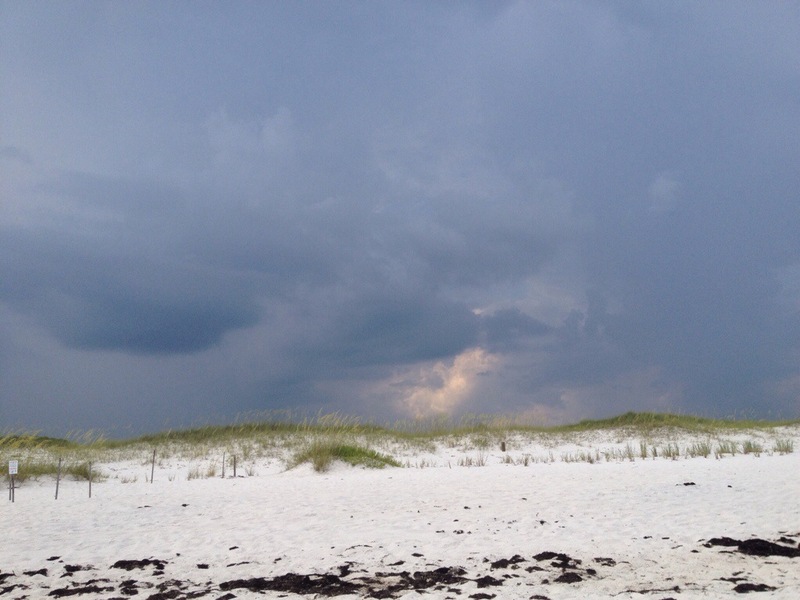 This may sound strange but the highlight of my afternoon was the big thunderstorm that ran us off the beach. 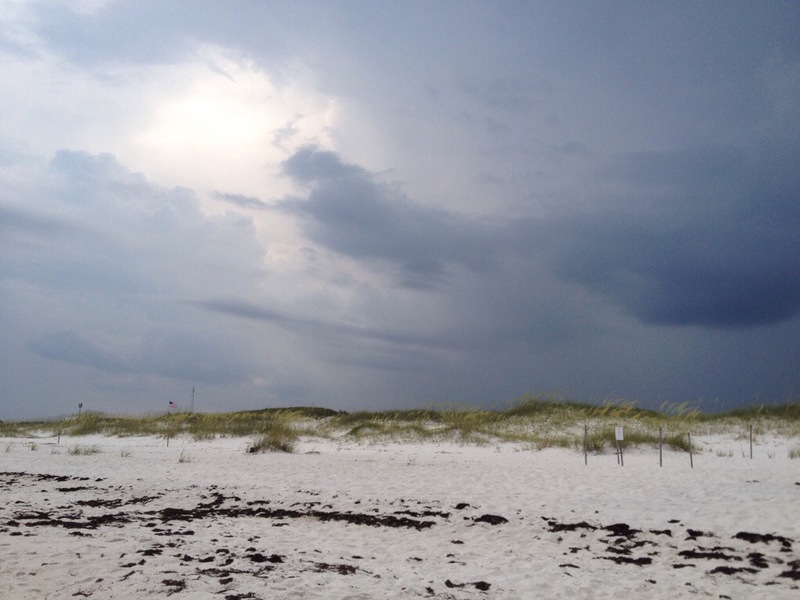 These type of storms develop off of the gulf most summer afternoons during the heat of the day. I have really missed these. 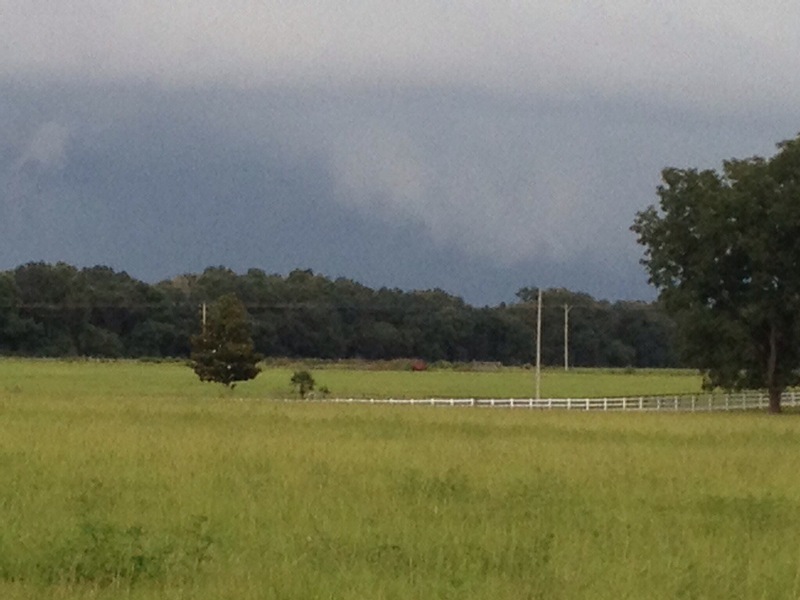 The rolling dark clouds are beautiful and the accompanying rain brings cool relief to the humid heat of the day. A view of the Gulf Coast for my English friends.